Green tea is a type of traditional tea that is enjoyed by consumers worldwide and was first cultivated in India and China, according to the University of Maryland Medical Center. Variations of green tea provide the same health benefits, except with varying levels of intensity, notes the website for Health to a Tea, a company that advocates drinking green tea for its health benefits and also sells tea. The similar benefits are due to the differences in which the tea leaves are processed. Japanese green tea reportedly contains 60 percent antioxidants compared with 12 to 16 percent for Chinese green tea. Both Japanese and Chinese green tea come from the leaves of the same tea plant, Camellia Sinensis. Japanese green tea, also known as matcha, is available in powder form. According to Sebastian Beckwith, cofounder of In Pursuit of Tea and contributor to the website of Dr. Andrew Weil, matcha retains its rich green color because the leaves are covered with mats prior to being harvested in May and lightly steamed to prevent fermentation. This process inhibits the leaves from receiving vital nutrients and as a result, more chlorophyll is produced. Once harvested, both Chinese and Japanese tea leaves are dried. Matcha is produced by pulverizing the dried tea leaves into powder form whereas Chinese green tea may be shaped into a ball, twisted or laid flat. While both Chinese and Japanese green tea provide similar health benefits, a study published in the September 2003 edition of "Journal of Chromatography" reports that the EGCG value of matcha is 137 times greater than that of China Green Tips green tea. 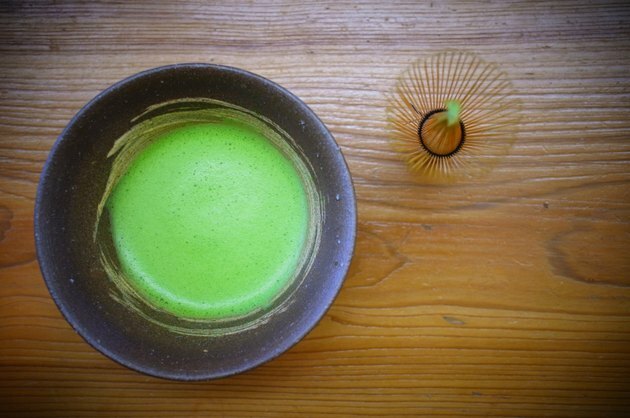 It is speculated that since matcha has been pulverized into powder form, tea drinkers consume more of the actual tea leaves rather than the water extract of traditional Chinese green tea. However, additional research is necessary to validate these claims and to further differentiate Japanese green tea from Chinese green tea. The University of Maryland Medical Center states that green tea is rich in powerful antioxidants, otherwise known as polyphenols, which neutralize free radicals. Free radicals, according to Rice University, may damage vital cellular components, such as DNA synthesis, and result in accelerated aging or cancer. Antioxidants may also help to inhibit the absorption of cholesterol in the intestinal tract and assist in the excretion of cholesterol. UMMC also notes that the polyphenols are classified as catechins and green tea contains six catechin compounds, including the most commonly studied compound, epigallocatechin gallate, or ECGC. According to staff writers for the website the Hoffman Center, a center for complementary medicine in New York City, the EGCG compound in green tea may help to establish a healthy blood-glucose balance. In the absence of blood-glucose fluctuations, the body may experience fewer cravings, which may lead to weight loss. Furthermore, the December 1999 edition of "The American Journal of Clinical Nutrition" published a study in which green tea consumers exhibited an increased rate of thermogenesis. Thermogenesis describes the process by which the body metabolizes fat to maintain or increase the body's temperature. According to the study, energy expenditure resulting from fat oxidation increased from 31 percent to 41 percent. Researchers credit the highly potent EGCG for the increased rate of thermogenesis. It is not clear whether the study referred to Japanese or Chinese green tea, or both. The polyphenols found in green tea may also help to alleviate symptoms of inflammation and promote a healthy heart and cardiovascular system. UMMC reports that green tea may soothe in the gastrointestinal tract inflammation, such as that caused by Crohn's disease and ulcerative colitis, prevent against atherosclerosis by lowering cholesterol and triglyceride levels and protect the liver from the damaging effects of toxic substances, such as alcohol. UMMC does not refer specifically to Japanese or Chinese green tea. American Journal of Clinical Nutrition; Efficacy of a Green Tea Extract Rich in Catechin Polyphenols and Caffeine in Increasing 24-h Energy Expenditure and Fat Xxidation in Humans; Abdul G. Dulloo et al.